The Elvis Presley Show June 3, 1956 Tan Promo Larger image below. Perhaps The Rarest And Earliest Promotional Record To Feature Excerpts Of The Young Elvis Live on Stage. Colonel Parker along with RCA Victor produced and authorized this mega-rare piece of Elvis history for the promoters of Elvis' first Oakland, CA concert on June 3, 1956 at the Municipal Auditorium Arena. The Colonel had this yellow hard cardboard promotional record produced the same company he used to produce the gold cardboard Truth About Me record that same year. The announcer on the record boasts that Elvis and The Jordanaires will not be appearing in San Francisco and this will be their only appearance in the Bay Area. Elvis can be heard performing Heartbreak Hotel, Blue Suede Shoes and I Want You I Need You I Love You. Pristine mint uncirculated and unplayed. Please note: This is the rare alternate tan color record. Housed in the original record envelope cover. This is written in stone!!! Paul Lichter's Elvis Unique Record Club was founded in 1970 and has been supplying Elvis fans worldwide for four decades. Paul has written 30 books about his friend Elvis and has often been called the world's leading Elvis authority. 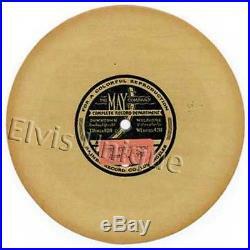 The item "Elvis Presley The Elvis Presley Show June 3, 1956 Rare Tan Promo Single" is in sale since Sunday, July 30, 2017. This item is in the category "Music\Records".com" and is located in Mesa, Arizona.